Need a new “S” Curve? If your business is like many others, it has progressed through a period of growth, followed by flattening out. The future is up to you. Will you begin the decline as many mature companies before, or will you start a new season of growth? There are two primary areas to consider to energize your growth: your approach to the market, and your approach to your management team. With regards to the market you pursue and your positioning, it is important to reassess whether doing what has brought you this far is the best course to continue. Many find that developing new products/services for an existing customer base is challenging. Commercializing new category starters often requires different skills and a cultural shift. For others, successful marketing is determined by finding new places to promote and deliver existing offerings. Management teams in maturing companies can become stagnant. A shot in the arm in terms of professional development of soft skills can be the ideal prescription. It is too easy to allow silos to develop and technical knowledge isolates without intentional growth of individual team members. Whether it is an executive MBA, or certificate programs, or simply using industry continuing education as a way to diversify one’s competencies, do something to make your managers more valuable! Added to the value of learning new skills is the benefit of gaining greater emotional intelligence. A mentor or coach brought in from the outside can guide managers into better decision making. The best course of action is to combine marketing/business development initiatives with management team professional growth. 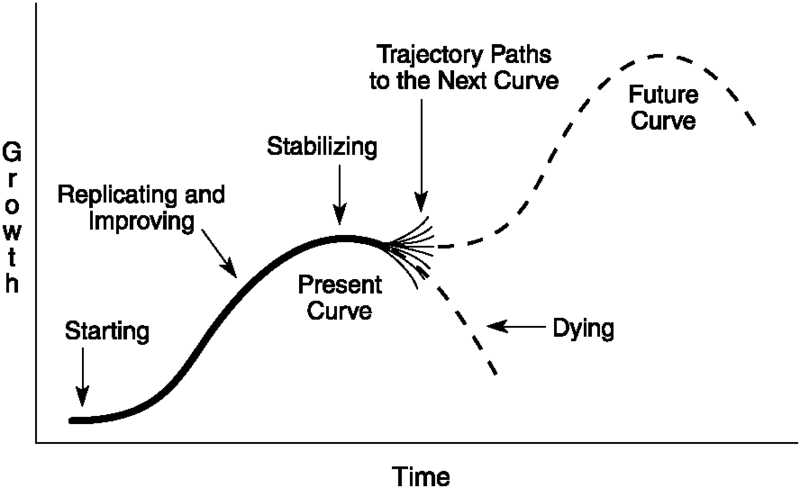 We hope you are successful in starting a new “S” curve in your business. Let us know if we can help! ← How “professional” is your services firm?